Environmental quality is impacted by energy choices. Human demand for energy is increasing. 6.3 Demand for energy is increasing. Greenhouse gases affect energy flow through the Earth system. 2.6 Greenhouse gases affect energy flow. Direct students to watch each projection at least twice: Once while focusing on the graph being produced, and then again to watch changes in the graphic at the bottom of the page. 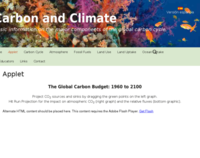 An interactive way to look at the global carbon cycle and its relationship with global warming. The estimated global temperature response is a rough scaling based upon average IPCC AR4 (2007) model sensitivity to atmospheric CO2. Students can adjust CO2 emissions from fossil fuels and land use (sources) and uptake from oceans and land (sinks). Comments from expert scientist: A one-of-a-kind resource that I use frequently in graduate and undergrad teaching, teacher training, and K-gray outreach. An essential tool for teaching climate science, climate policy, scenario development and integrated assessment. Excellent graphic that shows changes in the carbon cycle given different scenarios of fossil fuel use in the future. Students use the interactive as a tool to predict what temperature conditions on Earth will be given different levels of carbon released into the atmosphere. Shows the complexities of climate change and the usefulness and limitations of modeling. The teacher may need to explain to students that they must select a button under sources or sinks before they can manipulate the graph on the left. Good introductory material on home page http://carboncycle.aos.wisc.edu/. Easy to use and analyze the results. HS-ESS2-6:	Develop a quantitative model to describe the cycling of carbon among the hydrosphere, atmosphere, geosphere, and biosphere. HS-ESS2.D2:Gradual atmospheric changes were due to plants and other organisms that captured carbon dioxide and released oxygen. HS-ESS2.D3:Changes in the atmosphere due to human activity have increased carbon dioxide concentrations and thus affect climate. HS-LS2.B3:Photosynthesis and cellular respiration are important components of the carbon cycle, in which carbon is exchanged among the biosphere, atmosphere, oceans, and geosphere through chemical, physical, geological, and biological processes. HS-PS3.D2:The main way that solar energy is captured and stored on Earth is through the complex chemical process known as photosynthesis. HS-P1.2:ask questions that arise from examining models or a theory, to clarify and/or seek additional information and relationships. HS-P1.6:Ask questions that can be investigated within the scope of the school laboratory, research facilities, or field (e.g., outdoor environment) with available resources and, when appropriate, frame a hypothesis based on a model or theory. HS-P1.7:Ask and/or evaluate questions that challenge the premise(s) of an argument, the interpretation of a data set, or the suitability of a design.